Fall in love with Bangkok, strolling through its lively streets and admiring the architecture of one of the most magnificent kingdoms of the East. 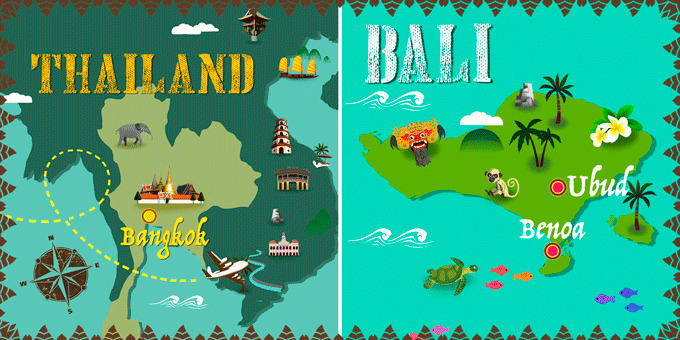 Head to Bali, a beautiful island in Indonesia and let yourself be seduced by its lush landscapes and rice fields. Discover Ubud, the cultural capital and immerse yourself in the turquoise waters of Benoa, one of the coastal paradises of the archipelago. 11 Breakfasts & 1 Lunch. *Depending on your departure date and flight time, it is possible you will spend your last night on board your departure flight. You can check your flight times when you select your desired departure date and flights. *If you are travelling to Vietnam with a US passport, you will require a Vietnamese visa. You can apply in https://evisa.xuatnhapcanh.gov.vn/web/guest/trang-chu-ttdt. For other passport holders, we recommend that you check with the Vietnamese Embassy for more details. Arrival at US departure airport ready to check-in for an overnight flight to Bangkok. Night on board. Arrive in the capital of Thailand and transfer to the hotel. Check-in after 14:00. Bangkok is one of the most influential, modern and lively cities in Southeast Asia due to it's economic, political and social development. Make the most of your time in the city by exploring the bustling street markets or enjoying some of the exotic street food on offer. Overnight in Bangkok. Breakfast at the hotel. Spend the day at your leisure, exploring the diverse neighbourhoods, sampling delicious street food at the bustling markets and perhaps visiting the many ornate temples the city has to offer. We recommend discovering the historic city of Ayutthaya. Overnight in Bangkok. Breakfast at the hotel. Free day to continue enjoying the city at our leisure. We recommend navigating the Chao Phraya River and visiting the Wat Pho temples, the largest in Bangkok where the famous reclining Buddha is covered with gold 46 meters long and the Temple of Marble, one of the most exquisite architectural works of the city. Overnight stay in Bangkok. Breakfast at the hotel. Transfer to airport for the flight to Bali. Arrive in Ubud and transfer to your hotel. Ubud is an excitingly vibrant town in the centre of Bali and is known to be a trendy and bohemian place with plenty of delicious dining options. Overnight in Ubud. Breakfast at the hotel. Today, spend the day at your leisure. Why not explore the local markets or indulge in a relaxing Balinese massage. We recommend an optional River Rafting Excursion or Mountain Biking if you are feeling adventurous. * Overnight stay in Ubud. Breakfast at the hotel. Enjoy a day at your leisure. We recommend exploring the tranquil rainforests or visiting the local Hindu temples and shrines. Overnight stay in Ubud. Breakfast at the hotel. Free day to relax, walk and for the more adventurous, maybe have a go at some water sports. Overnight stay in Benoa. Breakfast at the hotel. At the indicated time transfer to the airport for your return flight back to the US. Night on board.